Hello, everyone! We are just a day away from the end of November now. 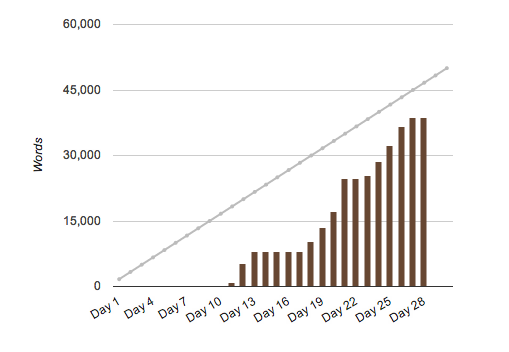 Those of us who have been participating in NaNoWriMo are finishing up the last few words. Some of us are already finished. Others are still working furiously. Where am I? Well, with 38,715 words at the time of this writing (the evening of the 28th), I have a long way to go in a short amount of time. The grey line represents where I should be if I stayed on par each day. Revolutionary, isn't it? Fine, so I'm sure everyone has heard this at some point. Some of us (including me, obviously, from the chart above) haven't taken this lesson to heart. Remember how on day five I admitted I hadn't written anything yet? That trend continued until day eleven. I had another stretch where I didn't write anything for four days in a row. So I effectively halved the amount of time I had to write, which turned out to be a very bad idea. I did manage to write quite a bit while family was in town for Thanksgiving, but I'm back to school now and there are a lot of demands on my time. In sharp contrast, my friend and writing buddy this month Brenna did much better than I did. She actually started on day one, and officially won with five days to spare. Take inspiration from her, not me. Brenna not only met but surpassed the target words-per-day goal nearly every day. Can you see the difference? She wrote just a bit every day instead of trying to cram it in like I am. Most of the time she wrote about 2,000 words, which for most people would take around two hours. A few days she did extra, but overall, her steady progress was more than enough to help her reach her goal. And guess what? She can sleep just fine tonight because she didn't save all the work for the last minute. 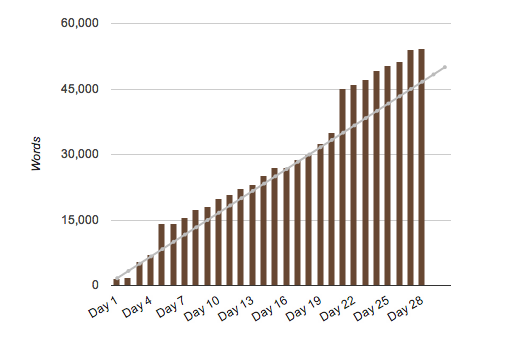 With three days and about 12,000 words to go, I'm not going to sleep much. Pray for me to finish. And please, for the sake of your stress levels and sleeping habits, remember: Procrastination is bad. Are you good at spreading out your commitments, or do you struggle with procrastination? Do you have any tips for how to beat the urge to procrastinate? You can do it, Hannah!!! So proud of you! !